UK comedian Ben Miller presents Enlightenment, an art history segment like no other! Art history often seems to be a solemn and serious topic - which does not make it into popular comedy as much as it used to. There seemed to be a bit more art history in comedy in the days of Blackadder and Monty Python, but it is something of a rarity these days. One of my favourite comedy skits is the 'Enlightenment' series performed by UK actor and comedian Ben Miller which is presented on the BBC's Armstrong and Miller Show. In a recurring segment - he apes the documentary stylings of someone like Simon Schama, taking us on a verbose journey about a work, though things don't always run smoothly for Mr Lincoln-Park! These lovely skits are short and(to me at least) very funny! Here is one looking at a Rembrandt work. 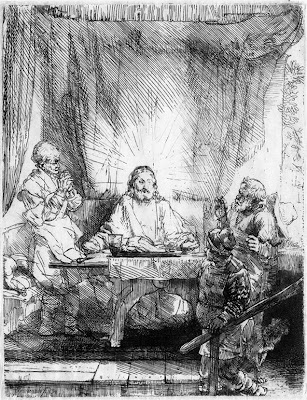 For accuracy sticklers - the 'pen and ink drawing' featured seems to be based on Rembrandt's 1654 etching Christ at Emmaus although the character in the skit is describing at as 'Christ among the money changers.' 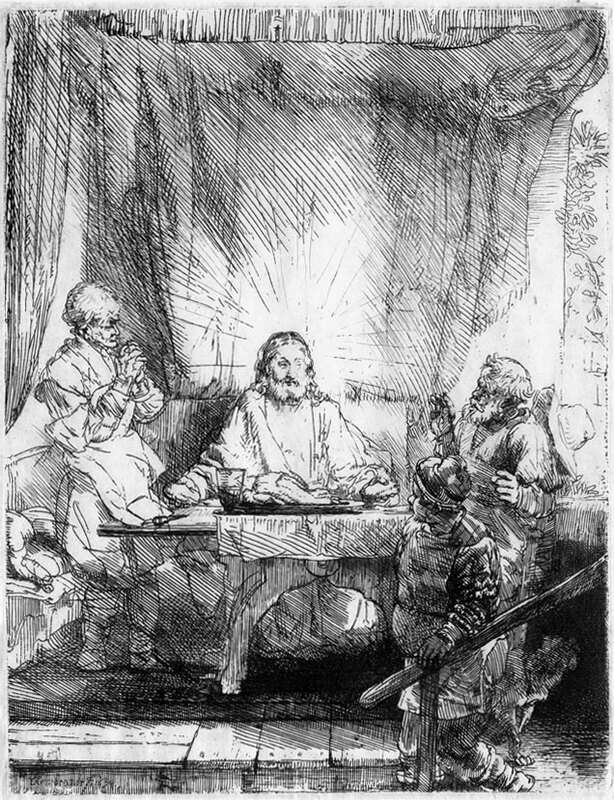 Rembrandt did do an etching of Christ driving the money changers from the Temple(1635), but this does not look like the prop used. Still, the historical accuracy isn't really the point - but I just thought I'd mention it as I too was curious to know if there actually was such an item as was being described. For those in the UK, there are more Enlightenment clips available on Armstrong and Miller's YouTube channel. For the rest of us, I'll try host some more here at 3PP as I come across them. For more art history related comedy, I'd also like to refer you to this post by art historian Catherine at Art History Ramblings, Artists on bicycles, which features a Month Python clip. Do you know Peter Cook and Dudley Moore's art gallery sketch? That's a funny clip! My husband was sitting on the other side of the room when I started the clip, and as soon as he heard Ben Miller start to speak, he said, "This is a joke...right?" We both enjoyed the skit. I'm glad you liked it M! I'm looking forward to having more clips in future. It's interesting hubby picked it as a joke straight away. Would he have had the same reaction to Simon Schama?! Speaking of Schama, that Rothko episode where he re-enacts his youthful self strutting around in a 70s garb was quite funny. Thank you for the mention, and I find art history very funny. Just the egos clashing alone bring about a lot of humor.